Author Roger Leslie, an award-winning writer and teacher, was motivated to write this book by his own personal battle with depression as a teen. Leslie provides readers with a specific plan for how to “get from where you are right now to where you want to be.” His methods will surely motivate teens to chase after their dreams, and find that they are in fact within reach. Students will learn from these activities the skills they need to make educated choices and to believe in their own abilities. Readers will also find Leslie provides a very interactive book, with spaces for teens to write in their answers to important questions. This allows a teen to look back on his or her goals, ideas, and thoughts to keep on the track toward success. Activities range from watching cartoons, to making a visual collage of your life, to simply changing your state of mind from a negative one, to a positive one. Every activity, no matter how simple, is an essential piece of the 50 step program Leslie has developed. 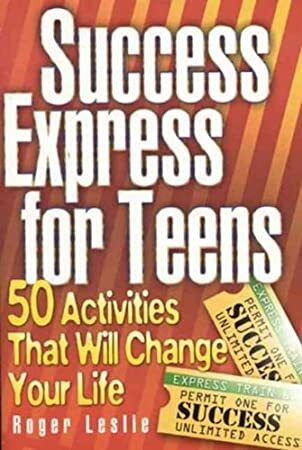 The activities laid out in this book will give teens the tools needed to believe in themselves, and to find their own personal definition of success. Roger Leslie's great sense of enthusiasm and determination, portrayed through his writing, will encourage teens to be of that same mind set. Teenagers in today's world are overwhelmed and stressed about making the transition from childhood into adulthood. These 50 activities are a great start at easing that transition and making it a more successful one as well. Quill says: A great resource for teens who are not quite sure what path they want to take in life, but are ready and willing to find out.